This freestanding heater from Optima Heaters offers up to 12sqm of heat coverage. It costs less than £200.00 and boasts a tonne of features, including an anti-tip safety shut-off, an advanced ingress protection rating of IP55, an economy mode with built in PIR sensor, timer function, remote control and offers low-glare carbon fibre based infrared heat. Optima Heaters have cracked the market with their range of advanced carbon fibre element fired patio heaters. With prices starting from as little as £49 and a 2-year warranty on all heaters, you’re in good hands. 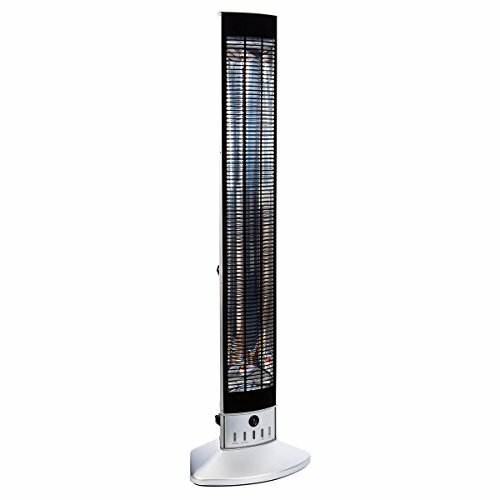 The Optima Heaters – Tower is a great middle-ground for commercial and residential users that want a no-fuss patio heater that is plug and play without having to ceiling mount or wall hang. You are paying a little bit more for the luxury of having a floor stand, but the stand is built from rust-proof aluminium that will withstand the test of time and we feel is well worth the money. This heater consumes 1.8kW of energy and provides up to 12sqm of heat coverage. 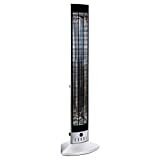 For the price and factoring in all the other features this patio heater has to offer, this is well within an acceptable range. As most heaters in the 1.8kW bracket provide 7-14sqm of heat. As with all the other heaters in this range, you’ll have a comfortable heating distance of 3.5m and at an angle of 130 degrees. These carbon fibre elements have a lifespan of over 8,000-hours. Making them attractive to commercial and home users, you’ll spend less time worrying about when the element will give up and more time enjoying the instant low-glare infrared heat. Unfortunately, there are no adjustable heat settings on this heater, but at 1800W there aren’t many occasions where you’d want to drop to 900W or less. Although the lack of adjustable heat is a bugbear, we’re glad to see this heater comes with a built-in economy mode & PIR sensor. If no movement has been detected for 4 minutes, the heater will shut itself off, conserving energy and the environment. 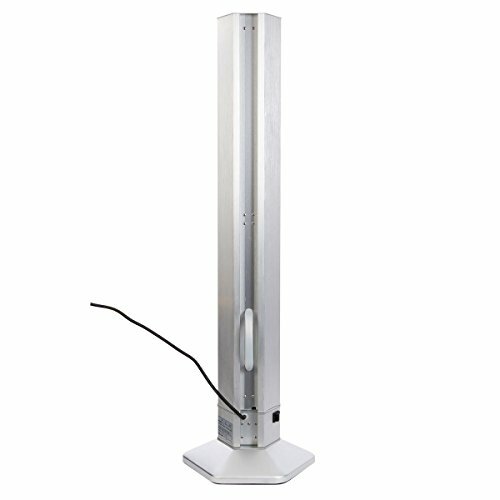 Each tower heater comes with a 1.9-metre power cable and 3-pin British standard plug. They call this heater the tower of power for a reason. It’s made from anodised aluminium and finished in brushed metal. This solid and rugged heater is built not only to impress but is incredibly functional. Solid rating 5 – protection from dust and solids. Liquid rating 5 – protection from low powered water jets. These practical and versatile patio heaters would make a great addition to any outdoor or indoor space, whether home or commercial. There is next to no maintenance required, aside from basic cleaning and when the time does come to replace the carbon fibre element, the easy-snap design makes this a doddle! Based on a purchase cost of £195.00 *check latest price* the hourly cost before electricity is just under 2 and a half pence (£0.024). To calculate the electricity costs you need to do the following – based on the average price of electricity at 14.7p per kWh in the U.K. Assuming we were to use this heater for 9 hours per day. This freestanding heater from Optima Heaters offers up to 12sqm of heat coverage. It usually costs less than £200.00 and boasts a tonne of features! We really do like the Optima Heaters range of patio heaters. They’re affordable and work in both commercial and home environments. 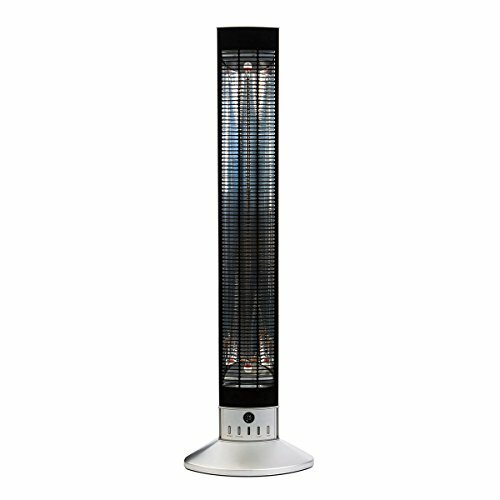 The carbon fibre elements make the long-term affordability of these heaters a lot more palatable as well. If you decide to purchase this heater directly from Optima Heaters you’ll be spending a bit more than you have to. Priced at £299.00 + £12 shipping. 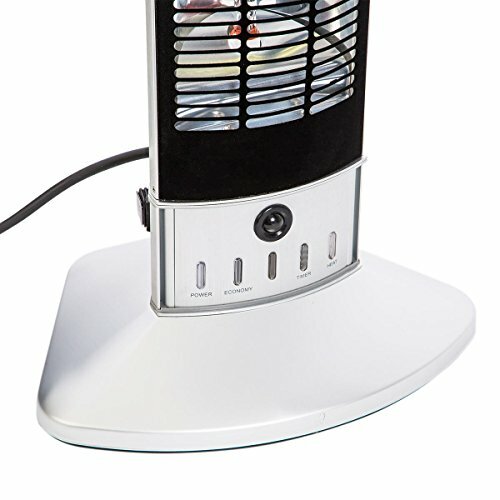 If you purchase this heater via Amazon you’ll be saving a whopping £104 (at a purchase price of £195.00 + £12 shipping)!